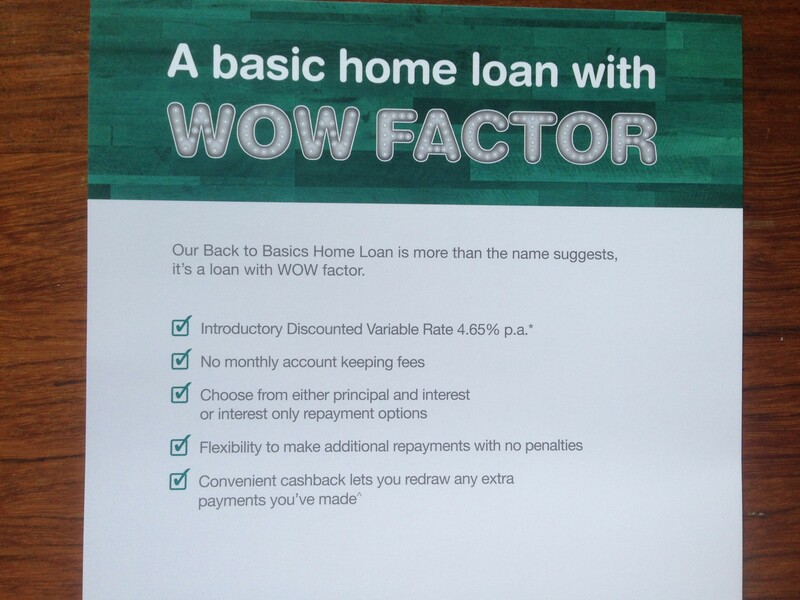 Suncorp’s “wow factor” loan misses one thing…the “wow factor”! Don’t you love marketing messages that make you think aloud, “I wish I did that” – like the Ole Lynggaard mailing I mentioned earlier this week. Sadly, the majority of marketing messages seem to aspire to mediocrity, regardless of media channel. It’s probably why we get excited when we see wonderful work. 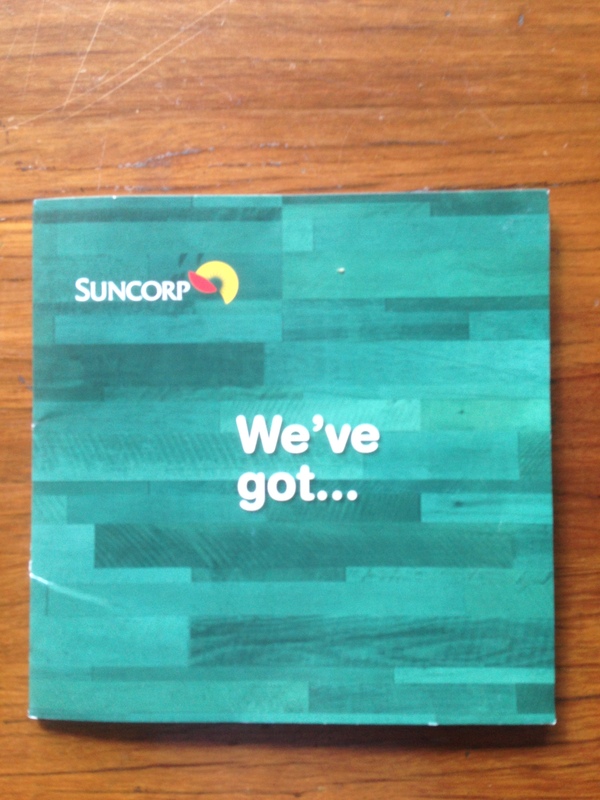 So how would you feel receiving this self-mailer from Suncorp, as I did last week? It breaks many of the rules, though not in a way that makes it work better. The first broken rule relates to the copy on the cover. He was right of course, though maybe a tad politically incorrect for some. There is nothing in this headline that entices me to proceed further. WIIFM? Where’s the benefit, offer, proposition, incentive or curiosity to motivate me to open the piece? I really don’t care what Suncorp has got. Rather than analyse this message page by page, I’ll let you see how it unfolded – so to speak. Because there is a subtle reference to all the folding in the final two words. Suncorp – We’ve got…your home…covered from…every angle. 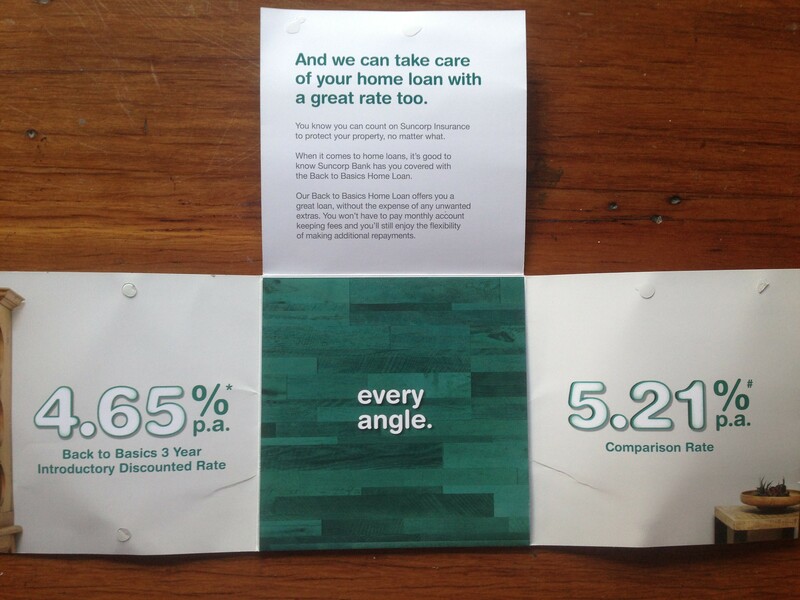 See what they did – folding the paper every which-way reflects the home coverage from every angle. Or maybe that’s just a coincidence, not a creative element? But here’s the offer folks. It was hidden under the final panel – A loan with WOW FACTOR! I’m not sure which focus group said “we want home loans with wow factor“? Is that really the sort of language people use? It’s a worry, because this loan doesn’t seem to have much of it anyway – wow factor that is. 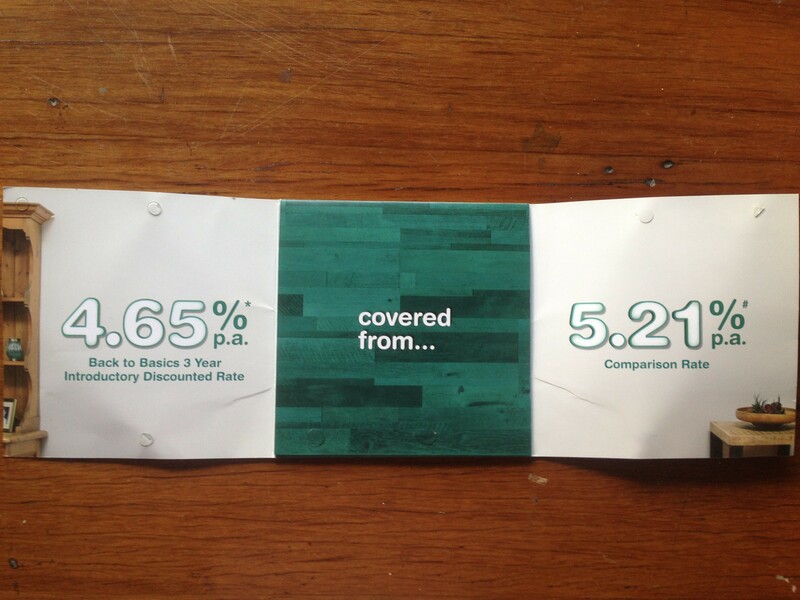 The low rate is only an introductory rate. All banks have loans with no account keeping fees. Most loans let you pay either P&I or Interest-only. Most loans allow flexible payments. (You’d be nuts not to pay your loan weekly if you want to really save on interest) I have a redraw facility but have no idea if it’s standard or not. So not much WOW really. 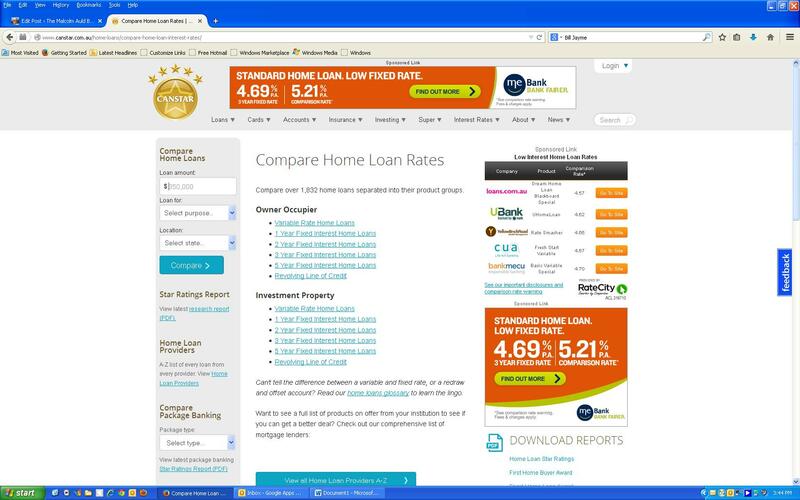 To confirm the WOW claim I went to the Canstar comparison site, by simply searching for “home loan rates” and clicking on the link. It only took a few seconds. Loans.com is 4.57%; UBank is 4.62%; YBR is 4.66%; CUA is 4.67%; and Bank mecu is 4.7% – so again very little WOW FACTOR compared to the market. One of the hardest things in marketing in the home loan market is to get people to switch. The pain of change is perceived as too much. Plus there is confusion about the cost – it’s why the banks have traditionally had so little churn of mortgage customers. The rule of thumb in financial services is that if you haven’t at least 0.25% better interest rate, don’t bother advertising. So you need more than just a rate to get traction with your prospects. Or is that the wrong jargon? Maybe I meant to say, “get engagement with your prospects”? So much marketing jargon – so little marketing sense. Wouldn’t it be better to just give prospects some reasons why it is easy to switch, given you offer a competitive interest rate? Want to know something about your neighbours? 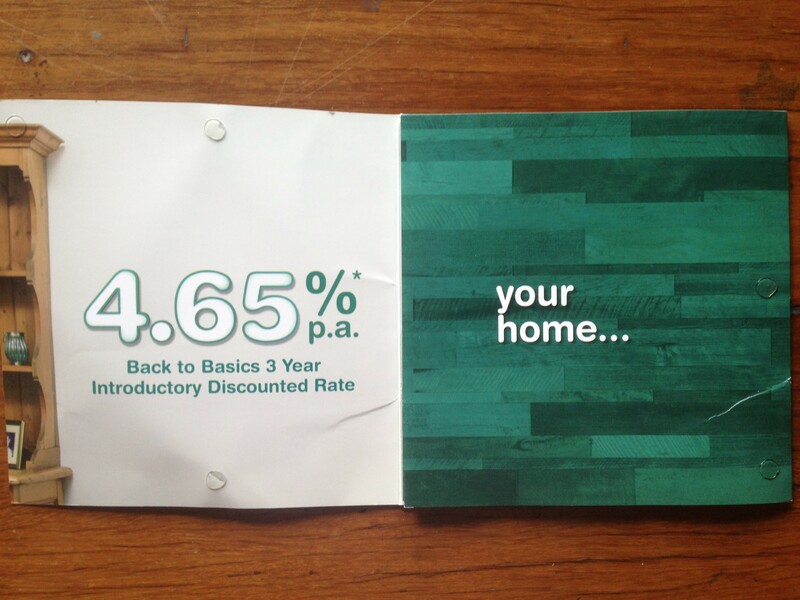 Inside the mailing you’d say something like: “they are switching their home loan to our WOW FACTOR loan“. Blah blah, special offer, blah blah..
I’ll bet my mortgage that more people are interested in what their neighbours are doing, than what Suncorp has got. If you write from your customer’s point of view, not yours, you have a far greater chance of success. But maybe it’s not Suncorp’s fault. Maybe a Content Marketing expert advised them. Probably told them you just have to create content then sit back and wait for the customer engagement to kick in. Don’t try to sell anything. Though I suspect using more than two words of content in the headline is probably advisable.